Can someone who grows up in hardscrabble reshape their lives by attending Yale, or are they destined to end up where they started? That’s oversimplifying the picture of a life lost that Jeff Hobbs paints in The Short Life and Tragic Life of Robert Peace. 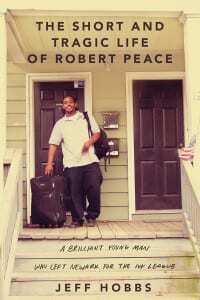 In a contemporary Mailer-esque fashion, Hobbs tells the story of his Yale roommate, Robert Peace, who grew up in the roughest area of Newark with his father serving life for murder. Peace earned a full ride to Yale, where he studied molecular biophysics and biochemistry and dealt marijuana, never able to escape the calling of the street. Hobbs’ writing is clear and he resists sinking into melodrama, a lesson for any writer, beginning or Pulitzer Prize winner, telling a heart-wrenching story. The narrative is strong and straightforward, and there isn’t a false note in the book. But what really hit home is that sometimes writers may be living their best material and not even know it.